BottleRock Napa Valley announces its sixth annual festival lineup today, which includes headline artists Bruno Mars, The Killers and Muse. The three-day music, wine, food and craft brew festival will take place in the heart of the City of Napa at the Napa Valley Expo, May 25 – 27, 2018. Festival passes go on sale at 10AM PST on Tuesday, January 9, 2018 at BottleRockNapaValley.com. 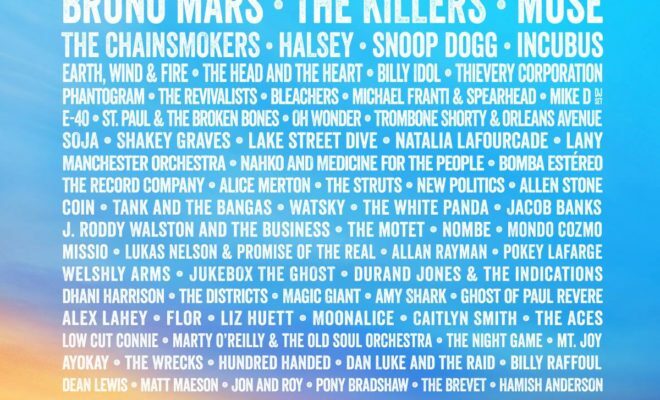 In addition to Bruno Mars, The Killers and Muse, the 2018 festival will showcase The Chainsmokers, Halsey, Snoop Dogg, Incubus, Earth, Wind & Fire, The Head and the Heart, Billy Idol, Thievery Corporation, Phantogram, The Revivalists, Bleachers, Michael Franti & Spearhead, Mike D (DJ Set), E-40, St. Paul & The Broken Bones, Oh Wonder, Trombone Shorty & Orleans Avenue, SOJA, Shakey Graves, Lake Street Dive, Natalia Lafourcade, LANY, Manchester Orchestra, Nahko and Medicine for the People, Bomba Estéreo, The Record Company, Alice Merton, The Struts, New Politics, Allen Stone, COIN, Tank and The Bangas, Watsky, The White Panda, Jacob Banks, J. Roddy Walston And The Business, The Motet, NoMBe, Mondo Cozmo, MISSIO, Lukas Nelson & Promise of the Real, Allan Rayman, Pokey LaFarge, Welshly Arms, Jukebox the Ghost, Durand Jones & The Indications, Dhani Harrison, The Districts, MAGIC GIANT, Amy Shark, Ghost of Paul Revere, Alex Lahey, flor, Liz Huett, Moonalice, Caitlyn Smith, The Aces, Low Cut Connie, Marty O’Reilly & The Old Soul Orchestra, The Night Game, Mt. Joy, ayokay, The Wrecks, Hundred Handed, Dan Luke and The Raid, Billy Raffoul, Dean Lewis, Matt Maeson, Jon and Roy, Pony Bradshaw, The Brevet, Hamish Anderson, Ethan Tucker, RIVVRS, The Alive, David Luning, The Knitts, Dani Bell & The Tarantist, Tommy Odetto, Sanho The Indian, Anchor + Bell, The Silverado Pickups and the Napa Valley Youth Symphony. The sold-out 2017 BottleRock Napa Valley featured Foo Fighters, Tom Petty & The Heartbreakers, Maroon 5 and welcomed more than 120,000 music, food and wine fans. Next Story → Shaky Knees Festival Reveals 2018 Lineup! Rihanna Announces 2016 “Anti” World Tour!